Incorrect installation of the washing machine. Sometimes, when the owners try to save on the quality of installation and connection of the washing machine, they may face the issue of unauthorized drainage of water into the sewer system. In such situation, the water in the drum simply does not have enough time to heat up to the required temperature, since warm water is constantly being drained into the sewage system and being automatically topped up with a new cold portion of water. Incorrect washing program. Washing machine may not heat the water simply because the selected washing mode does not imply that. How is that possible? It may happen due to a lack of focus, when the owner selects the wrong program. The heater (tubular electric heater) has burnt. It’s simple – the water does not heat up, because the heating element has failed. There may be several causes for the failure – power surges, short circuit, manufacturing defect, age (considering our quality of water the heating elements serve an average of 3-5 years). In this case, the replacement is the only option. Thermostat (water temperature control sensor) is out of service. 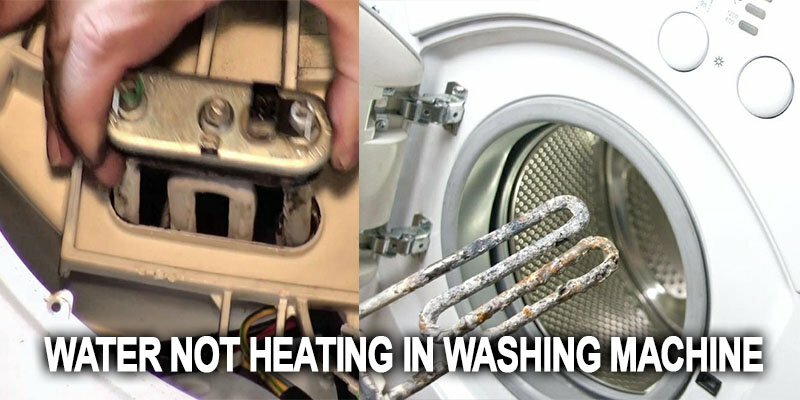 Depending on the model of your washing machine, thermostat can be located either in the heating element itself or it may be located separately on the surface of the drum. It monitors the temperature of the water and sends signals to heat the water if necessary. Faulty control module (programmer). What might happen to it? Anything, starting with damaged wires and contacts (for example, micro cracks in the board tracks) and ending with corrupted firmware. As a result, the control module (the main brain center of the washing machine) begins to fail and it affects the whole operation of the appliance. Different models of washers behave differently when water heating issues arise. Most often, modern models of washing machines stop the washing process at the point when water heating should start, and then display an error signal.